Join the discussion on our forums! Come discuss Hunting Party over in our dedicated Hunting Party discussion topic. Voone did not see play so far and it does the same effect (kinda) for less mana AND it puts a decent minion in play. This here is just horrible. Not the worst card in the expansion, but still a bad one. Why does this cost 5 mana ? This card is very slow for any hunter deck. The only possibility to play this is OTK shenanigans. In all other hunter decks, this card is too slow and will never see play. Hunter Can't Do Cute Tricks ™. 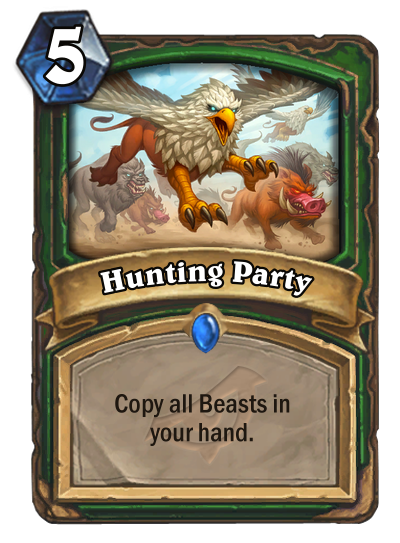 Oh, these good old 5-mana Hunter cards... King of Beasts, Piranha Launcher, Cobra Shot. Absolutely no chance to see this garbage outside of Trolden videos. So, by what I can gather, this adds copies of all beasts you already got in your hand. Hand buff, Razormaw, Boar, OTK shenanigans, anyone? It gets good at 3 beasts. Would be like 5 mana draw 3 beasts (but better because you decide when to do it, and also is card generation). Its a better (?prenerf¿) Nourish at 3 beasts. This is insane value but too extensive.